Personal projects often take a lot of planning and persistence to pull off. They are passion driven assignments which is a big part of why they are so important to evolve as a photographer. However, sometimes opportunity and timing don't line up so you have to make the best of a poor situation. This is when experience and determination make or break an idea. This is exactly what happened to photographer Michael Calabro last October on Lake Michigan. 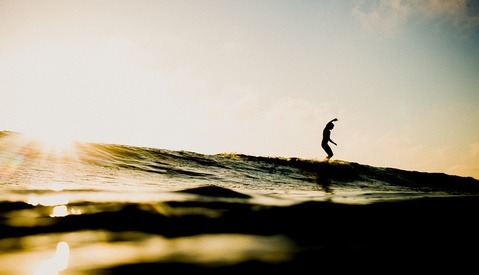 An outdoor lifestyle photographer based out of Chicago, Calabro has worked with all kinds of great clients from Nike, Red Bull, and Victory Motorcycles to Outside, and Surfer magazine just to name a few. His commercial and editorial work has taken him all around the world but it's his personal project documenting the little known Chicago surf scene that has gotten him some recent attention. 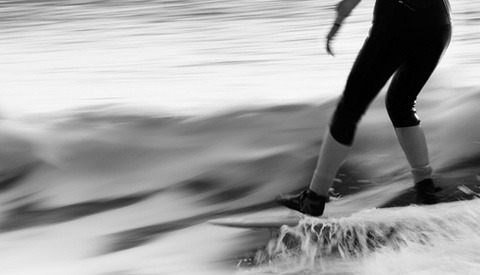 "Yep, you can surf on a lake and it actually gets good if the conditions are just perfect, " said Calabro. Surf is at its best on the lakes going into the winter when the weather gets bad. Winds traveling over the length of the lakes can produce some pretty impressive swells and on a good day, quite a few surfers can be seen out in the cold. 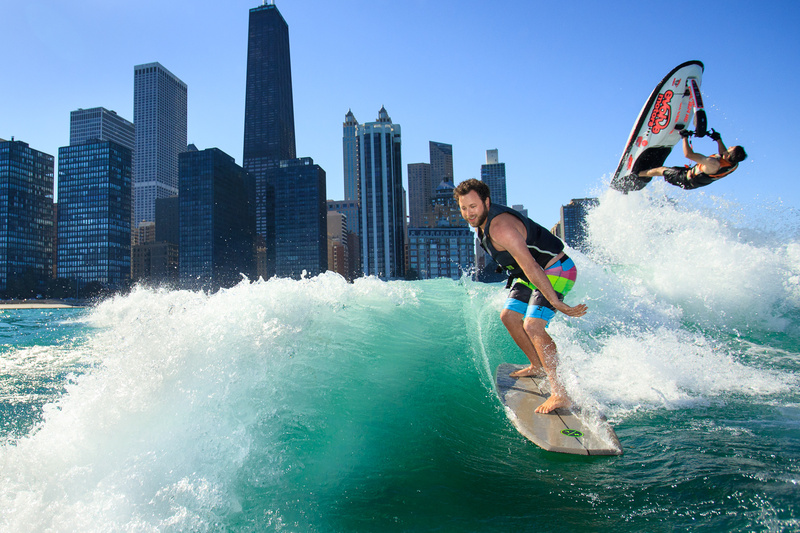 This particular day, however, was not your average Chicago October day and there weren't any waves on the lake. 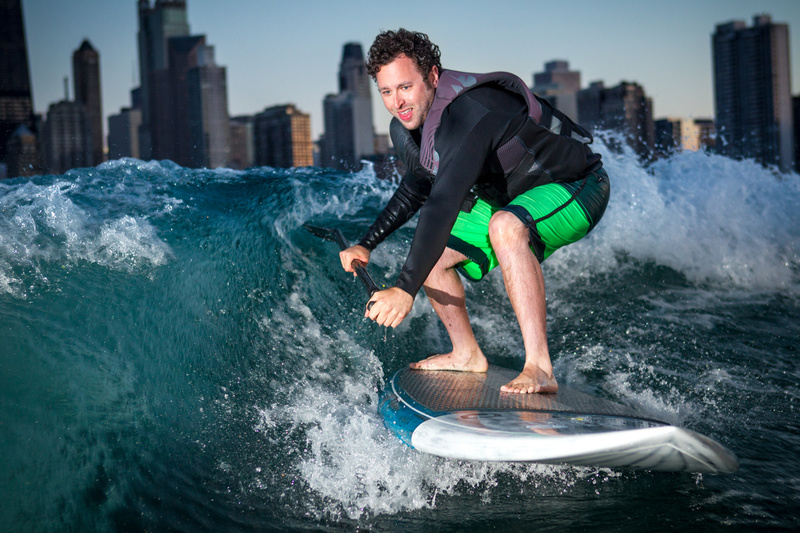 When the weather is nice the community has turned to a newer water sport called wake surfing. 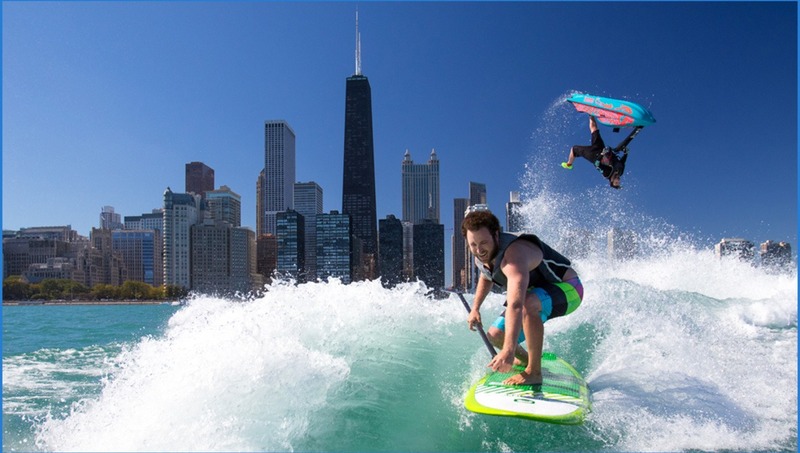 Wake surfing is a mix of surfing and wakeboarding combining a lot of skill and tools from both, using either a traditional surfboard or a newer board designed specifically for wake surfing and a boat. By creating large wakes with the boats powerful motor surfers can turn just about any body of water into a surfable location. It was 80 degrees out in early October when Calabro got a call out of the blue from a friend who owns a paddleboard rental company. He had his boat out on the water and had just met a couple of jet skiers who wanted to do some tricks using the wake of his boat, but they were only going to be around for a couple of hours. "He told me if I wanted to shoot this to meet him at the docks in 15 minutes! " which was going to be impossible Calabro explained. It would probably take 15-20 minutes to get there plus another 30 minutes on the boat to get out of the harbor to where the jet skis were. So with no time to plan or pack he grabbed his bag and headed out anyway. When they finally caught up to the jet skiers things didn't go any smoother. Quickly attempting to wave everyone over, Calabro set out to introduce himself, go over the plan, his vision, and make sure everyone knew this was all about being safe while having fun. None of this actually happened. This happens and you have to deal with it saying "Sometimes, the extra adrenaline caused by frustration gets my creative juices flowing." You would think an intricate shot like this with so many different people involved, using heavy machinery, and all on the water, would take walkie-talkies, lots of planning, and constant communication to pull off, and you would be correct. Unfortunately, there was none of that for Calabro. It took several passes over the course of an hour just to get the boat driver to understand he had to keep the skyline behind him. Eventually, after pulling up alongside the boat, Calabro was able to explain a little better of what he needed the jet skiers to do. With that and a few more passes, things were starting to come together. That's when one of the jet skiers decided it would be funny to spray Calabro while he was taking shots. What probably was meant to be a little splash was really a complete drenching of both him and the camera. As adventure photographers, we know our gear can take a beating and withstand some pretty bad weather but this was more like dropping the camera into the water for a second. So pretty upset and putting everything on hold, a quick phone call was made to Canon's Professional Services. After walking him through a few quick checks and procedures, Calabro felt the camera was ok to continue shooting with, but by this time everyone's attention is divided. The driver keeps going the wrong way putting the skyline in the wrong direction, and when the boat is in the right position the jet skiers are off somewhere else showing off to girls on other boats. After a few more passes the gas was getting low and the jet skiers had to leave, bringing it to a close. After everything was done Calabro figures he got about a dozen passes half of which didn't have the skyline lined up in the shot. Mixing the normal difficulties of managing so many different working parts on a shoot with no real planning and communication beforehand, really made it tough on him. His experience working on the water shooting boats is what helped to pull off the amazing shots he did manage to get. No one was really there for a photo shoot and other than almost getting his gear destroyed, Calabro said the day was all fun and games. Plans are already in place for this coming summer to try and re-shoot the idea and make it even better. Thanks for the great write-up, Mr. DeStefano.